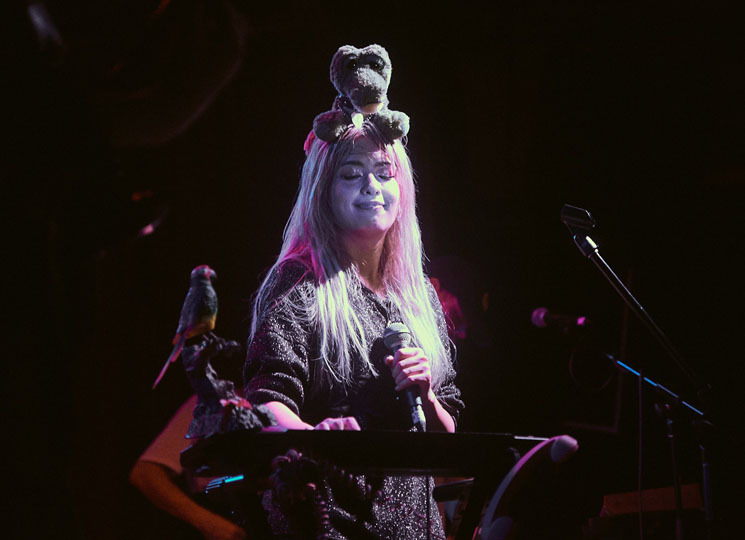 Kero Kero Bonito trickled onstage like deliberate drops. First the bassist, then the drummer, then the backing guitarist; their ringleader, Sarah Midori Perry, ran out last, long hair lit like cotton candy. They loved doing this, buoying tension. They blew taut bubbles mid-song — suddenly silent between verses — only to pop them ferociously. They had to hold back for a breath, because their fans were frantic. As soon as Sarah drummed a finger across her lips, they yowled, they knew: "Lipslap" was next. A stuffed flamingo held high and a lifted, bent knee: "Flamingo." If barely distinct from the roar, Perry's voice was serene amidst the springs and spurts and shrieks. She groaned too, twice, hair cloaking her face, unleashing the tune's inky innards, their giggles' manic twists. Some diction was eerily didactic — "How many shrimps do you have to eat / Before you make your skin turn pink? / Eat too much and you'll get sick" — and her movements made it all the more so. It's not hard to guess what she did when she called out, "Pull up your feet!" Flamingos and shrimp weren't her only show creatures; an alligator sat on Sarah's head, only to be tossed off because "he bites." She serenaded a plastic parrot as he bobbed his head. "I think he liked it," she giggled. On that stage, anything could be alive. Sarah's right cheekbone — and a couple in the crowd — was initially dashed with blue glitter. By the end of the night, the sparkles had been replaced by a slicker gleam. "Kero, Kero, Kero" was the encore chant. They waited — then they burst.